Last year I made too much jam. How much is too much jam, you ask? Well, I have 6 fruit trees that had a very good year (3 plum, 1 cherry, 2 pear), I liberated some seemingly abandoned trees of their fruit, and I bought that which I could not grow or find. We were planning on running a 6 bedroom B&B up the mountain, and so I made enough jam to supply it for the year. And wouldn’t you know it, at the end of last summer the deal fell through, and I was left with hundreds upon hundreds of jars brimming with beautiful summer jam, and no one to feed it to. No one, because my husband and I don’t really like eating any jam except for strawberry. And we both despise plum jam. Given that I have three very productive and large plum trees, I don’t think I need to tell you what kind of jam 90% of my production was. 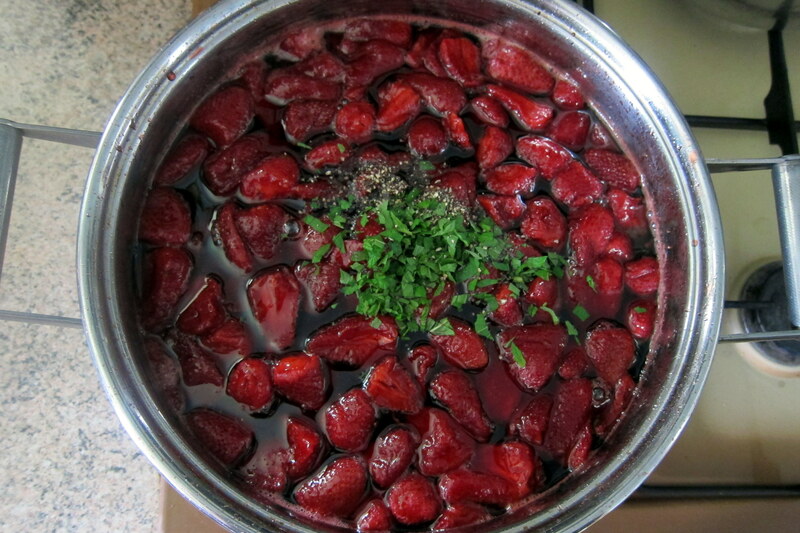 I got pretty creative with it… I started off with straight jam, but then I added star anise to the little dark plums, and chamomile to the white plums. Elderflower plum jam also made an appearance, as did black plum & ginger, and white plum & cardamom. I have to admit that I really like the star anise plum jam, it is absolutely divine spooned on top of well aged cheese. The point of this story? Please come visit me and take an armful of plum jam. 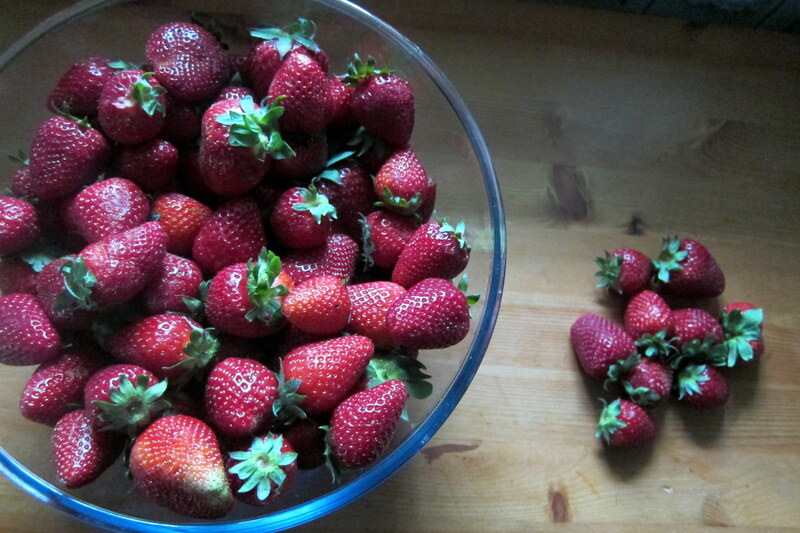 And to say that this year, the ONLY jam I plan on making is strawberry. A few weeks before I met my Italian husband 6 years ago (nearly to the day! ), I was traveling around southwest France with my parents. Every day we would go to a different farmer’s market, and every day we would find something that was undoubtedly the best thing we had ever tasted. There were a lot of French jam ladies, with the most gorgeous and delectable jams we had ever encountered. Talking to them, we discovered that they all learned to make jam from Christine Ferber’s book. That lady is a genius. I think the best thing I ate on that trip was a slice of apricot sourdough bread topped with local sheep cheese (made and sold by a smoking hot French guy, of course) and a dollop of strawberry, mint & black pepper jam, all from a small farmer’s market. Pure heaven. This recipe is adapted from Christine Ferber’s book, Mes Confitures, available in French and English. I lowered the sugar and upped the mint and black pepper. I do not recommend lowering the sugar any further than this or it won’t have the right consistency. 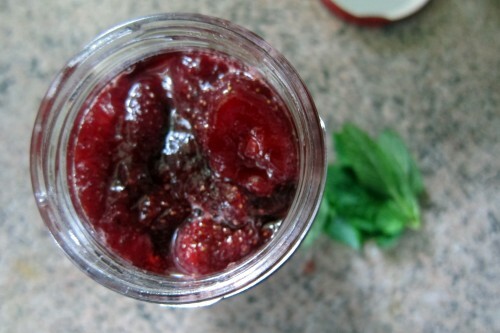 For detailed jam making instructions, see THIS post. 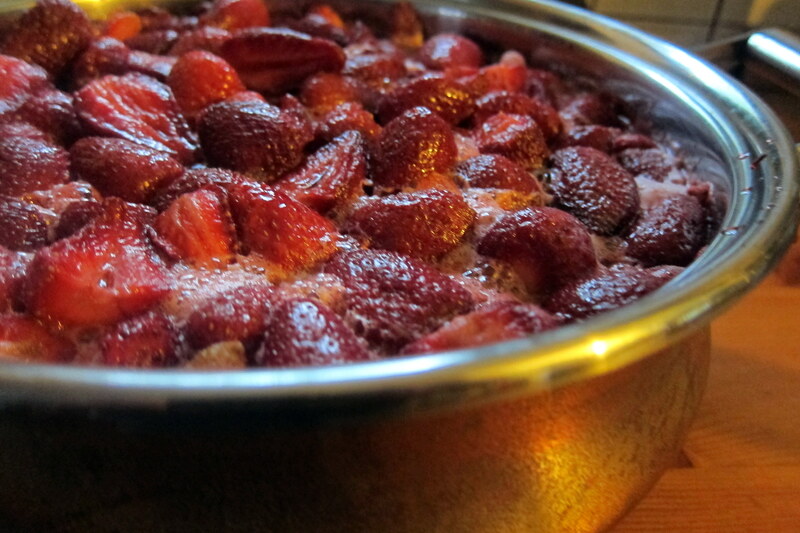 The great thing about this recipe is that it isn’t really jam, but rather whole strawberries in a strawberry syrup. If you want it to be more jam-like, you can either chop your strawberries up small or give it a few whirls with an immersion blender near the end of the cook. Wash and dry your strawberries. Cut off the caps, and leave whole if they are small, or cut in half if they are a bit chunky. In a large bowl, combine your cleaned and possibly cut strawberries, sugar and lemon juice. 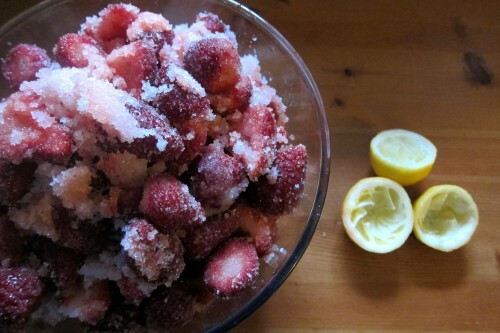 Gently mix together, and cover with parchment paper or plastic wrap. Stick it in the refrigerator overnight. 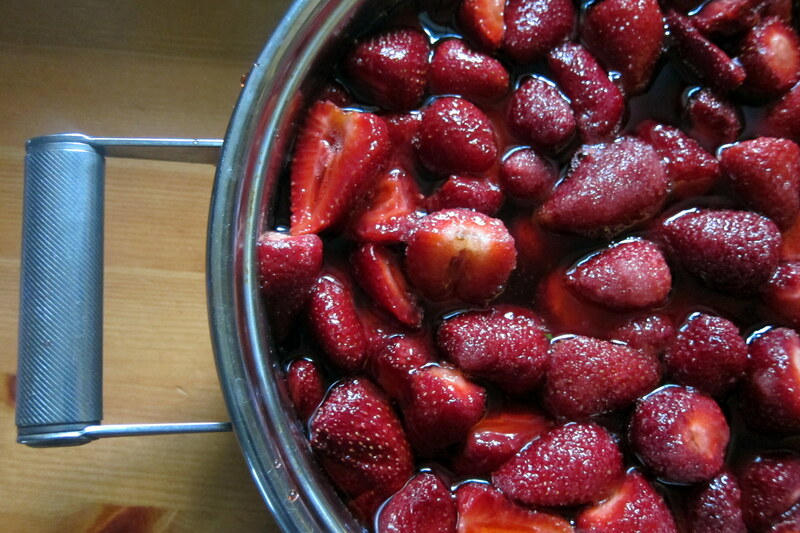 The next day (or whenever you get around to it, I’ve left it for longer), you should see that you have strawberries floating in sugary strawberry water. What happened is that the sugar went into the fruit, and the liquid went out. Osmosis, baby! Pour all of this into a thick bottomed pot (wider than it is tall, if possible, and if you have a copper pot this is the time to use it!) and bring to a low boil for 10 minutes. 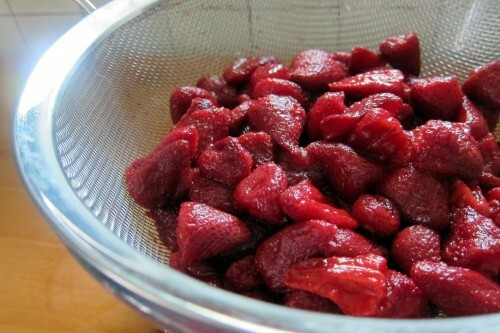 Pour this back into your bowl, cover, and refrigerate overnight. On the third day, or whenever you get around to it, pour your concoction through a strainer over your pot to separate out the strawberries. Bring your strawberry liquid to low boil, and stir it every now and then. We are concentrating the syrup without overcooking the strawberries! Leave your strawberries aside for the moment. 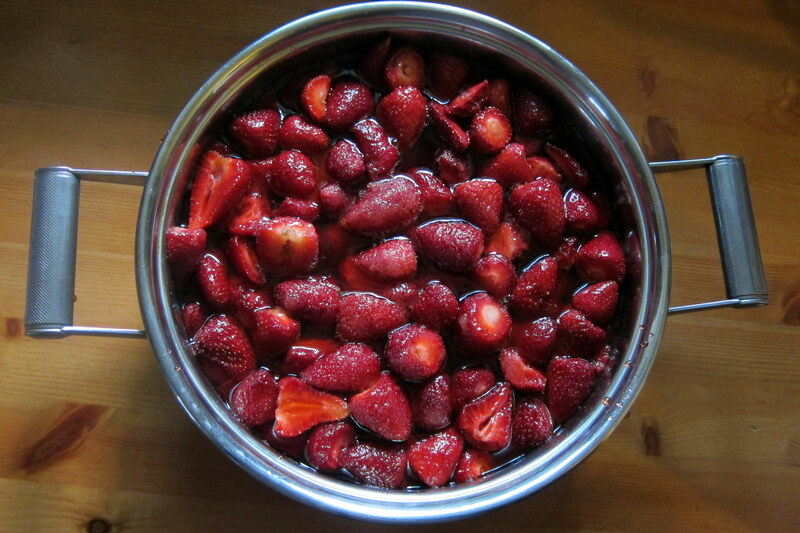 You will want to cook the strawberry liquid for quite awhile (takes me about an hour)…. how long depends on how watery your strawberries are, what kind of pot you are using, how much you are making, and possibly some magical component I don’t know about. It won’t look much noticeably thicker when it is done, but there are two ways to figure out when this step is over. 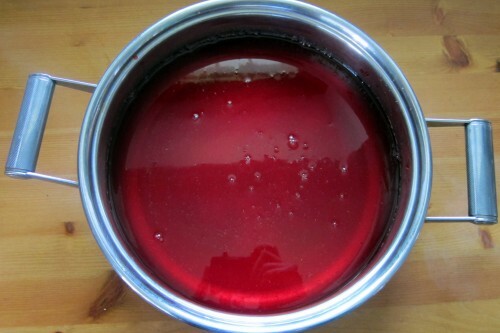 2) When you start cooking your jam, put a plate in the freezer. When you want to test for doneness, drizzle a little bit of jam/cooked strawberry water on the cold plate, let it sit for two minutes, and run your finger through the drizzle. If you finger leaves a distinct trail in the jam, it is probably done. 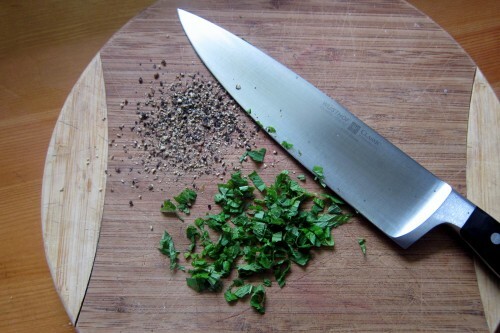 Now you want to chop up your mint and grind your pepper. 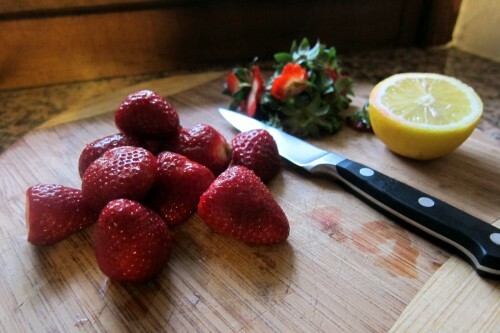 Add your strawberries, mint, and black pepper to the pot. Stir and bring to a gentle boil for 10 minutes. If you get foam, skim it off. Can according to whatever method you use. If you don’t know how to safely can, I wrote a handy tutorial. If you don’t use new lids and the water bath method to process your jam, please keep your jam in the refrigerator until you eat it! I highly recommend drizzling this jam on top of chocolate cake, it is probably the best thing in the world. And eating it out of the jar with a spoon. 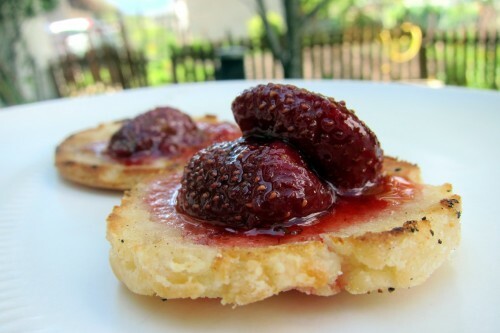 Strawberry, mint & black pepper jam is extraordinary on a gluten free biscuit! Perfect timing! I was planning to make this over the weekend. Also, I should have taken some of your plum jam home! Clearly I need to come back. Let me know how it goes, and PLEASE come visit me to take some of this plum jam. Did I show you my massive jam stash before? Wow, that’s a lot of jam! I need to make some more myself. 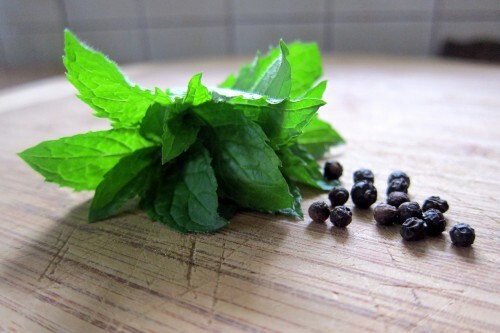 It shouldn’t be super peppery or minty; the pepper and mint there to add a subtle complexity to the strawberries without being ‘in your face’. Or you could add more pepper if you want a super peppery jam!